Hot and hazy conditions combined with southerly winds are resulting in elevated smog levels across parts of southern Ontario. This smog advisory will remain in effect until further notice. * A Smog Advisory means that there is a strong likelihood that there may be poor air quality within the next 24 hours due to ground-level ozone and/or particulate matter. It is an indicator of air quality, based on air pollutants that have adverse effects on human health and the environment. Smog is harmful to the lungs and heart. Even in healthy people, smog can reduce lung function. A Smog Advisory is related to the Air Quality Index (AQI), which rates how clean the air is. The AQI scale ranges from 0 to 100+. Higher numbers mean higher health risks. A Smog Advisory is issued in your region when the AQI is expected to reach 50 in the next 24 hours. It can be lifted once the AQI is expected to reach or drops below 50. Smog is made up of a complex mixture of air pollutants that are sometimes visible, such as a brownish-yellow haze over cities; sometimes not. The two main ingredients of smog are ground-level ozone (O3) and fine particulate matter (PM2.5). A smog advisory has been issued for some regions of southern Ontario. A high pressure ridge over Ontario is causing sunny skies over most regions, except for some cloudiness during the afternoon over southern Ontario. Increasingly hot temperatures are forecasted with light winds over most regions. Similar conditions are expected except for increasing humidity as well as partly cloudy skies caused by a weak weather disturbance which is forecasted to move northeastward across the eastern Great Lakes region. Air quality indices are forecasted to be in the good to moderate categories in all of the forecast regions, due to ozone and fine particles. A weak low pressure trough is forecasedt to move eastward across southern Ontario. Very warm and humid conditions with light winds are forecast to continue with partly cloudy skies and possible precipitation. Partly clearing skies and west to northwesterly winds are expected following passage of the trough. 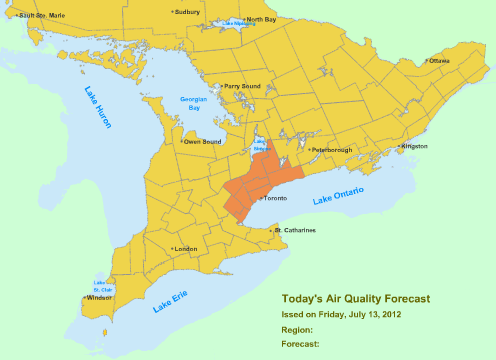 Please click here for details on air quality in Ontario. Please click here for more info about smog.